This is a relay board with 1 high current relay. It is ideal board to control & switching high current loads like fan, lights, low power heater coils. It not only provides switching but also provides isolation between the power device and your microcontroller. Devices upto 7 Ampere can be switched using this relay. These are 12V relays but can work with any microcontroller, arduino & Raspberry pi as well. 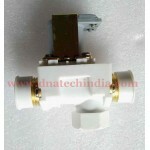 Solenoid Water Valve 12 VoltThis is a Normally closed 12 Volt operated Solenoid Valve perfect f..
MINI PIR SENSOR HC-SR505 HC-SR505 Mini PIR Motion Sensor is based on infrared technology and it..
24V Relay Board 1 ChannelThis is a single channel relay board with one 24 volt high curren..